SpaceX, NASA and Air Force personnel who will help astronauts out of the SpaceX Crew Dragon spacecraft returning from a mission to the International Space Station have begun practicing for that using a full-size model of the spacecraft. 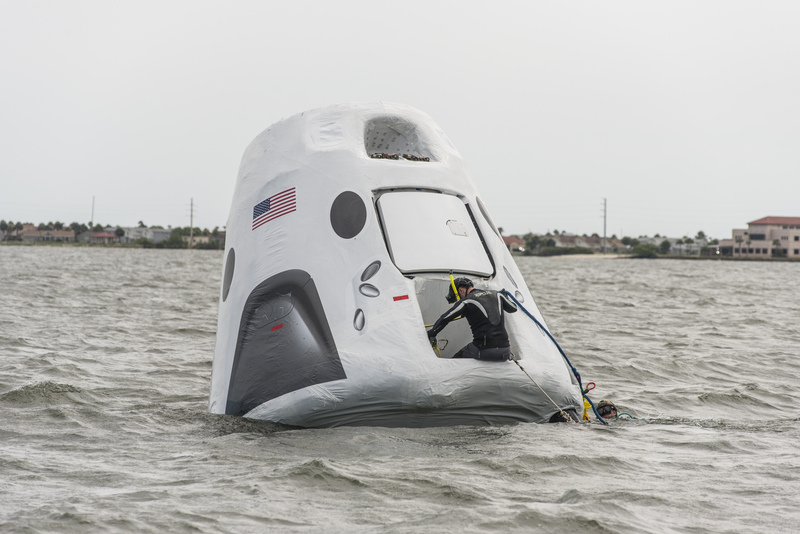 In certain unusual recovery situations, SpaceX may need to work with the U.S. Air Force to send parajumpers to recover astronauts from the capsule in the water. Recently, the Recovery Trainer was lowered into the Indian River Lagoon near NASA’s Kennedy Space Center so Air Force pararescue and others could learn techniques for getting aboard the spacecraft and rescuing the astronauts. Such rescue practice is typical of all human missions because it gives astronauts and support teams many opportunities to practice and refine the critical steps in safely rescuing the crew in a contingency situation. A number of procedures will be developed and then practiced over time to deal with recoveries in many different conditions. SpaceX is developing the Crew Dragon in partnership with NASA’s Commercial Crew Program to carry astronauts to the International Space Station. The Recovery Trainer was built by SpaceX and subsequently modified by Kennedy’s Prototype Lab to SpaceX specifications. The same dimensions as the outside mold line of a Crew Dragon, it has indicators where thrusters will be and other markings on the exterior. Inside, the crew area matches that of the operational spacecraft and includes an instrument panel. *NASA, Boeing and SpaceX provided an update on Oct. 4, 2018. For the details on the flight tests and the latest schedule, visit https://go.nasa.gov/2QuP7F1. The next generation of American spacecraft and rockets that will launch astronauts to the International Space Station are nearing the final stages of development and evaluation. NASA’s Commercial Crew Program will return human spaceflight launches to U.S. soil, providing reliable and cost-effective access to low-Earth orbit on systems that meet our safety and mission requirements. To meet NASA’s requirements, the commercial providers must demonstrate that their systems are ready to begin regular flights to the space station. Two of those demonstrations are uncrewed flight tests, known as Orbital Flight Test for Boeing, and Demonstration Mission 1 for SpaceX. After the uncrewed flight tests, both companies will execute a flight test with crew prior to being certified by NASA for crew rotation mission. The following schedule reflects the most recent publicly-releasable dates for both providers. Vice President Mike Pence saw a Florida spaceport Thursday poised in the starting blocks to return America’s human launch capability, begin a new era in deep-space exploration and capitalize on emerging partnerships with private industry. Working in close partnership with NASA’s Commercial Crew Program in a process new to human spacecraft development, Boeing and SpaceX are making independent spacecraft and launch systems to take astronauts to the International Space Station from America. Boeing is building a line of Starliner spacecraft and SpaceX is making a crewed version of its Dragon spacecraft. Both spacecraft, along with their launch vehicles, mission and launch control systems, are being certified by NASA for safety, reliability and cost-effectiveness. Seen together, the transformation of the center shows the form of a spaceport that has embraced the potential of new partnership approaches while holding onto its heritage of success and broaden the range of exploration for the nation. Driving through much of the launch and processing facilities spread throughout the 144,000 acres of NASA’s Kennedy Space Center, Pence saw launch pads rebuilt for the needs of privately operated rockets, former space shuttle hangars refit to serve as spacecraft factories and the assembly hall for NASA’s own deep-space exploration spacecraft, Orion. Former astronaut Bob Cabana, Kennedy’s center director, guided the tour for Pence who was making his first stop at the center since becoming vice president. 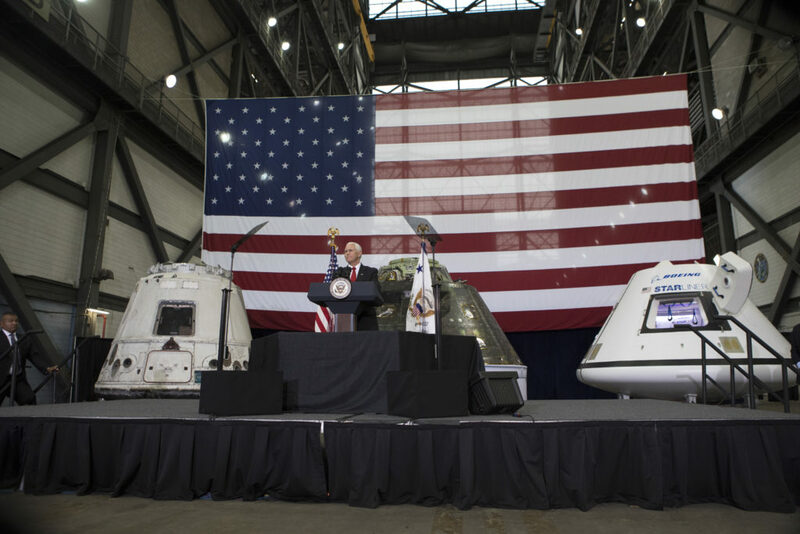 As vice president, Pence will serve as chairman of the newly reformed National Space Council that will set goals and establish policies for the United States’ space efforts. Read complete coverage of Pence’s visit to the Florida spaceport at www.nasa.gov. 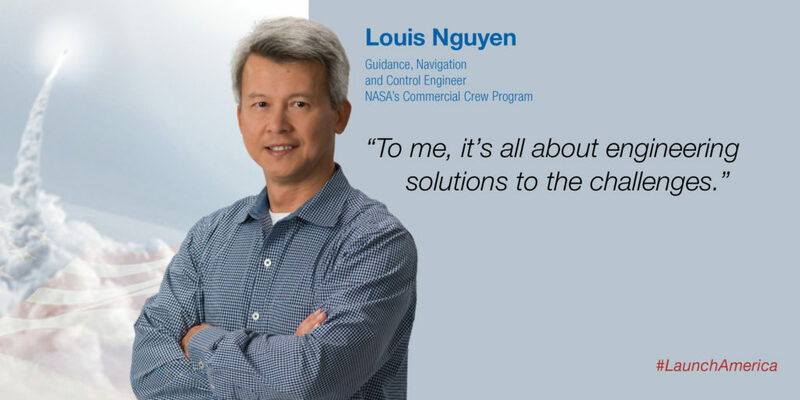 As a NASA engineer in guidance, navigation and control, Nguyen evaluates the companies’ systems that steer and tell a spacecraft where it is and where it’s going. He works closely with both Boeing and SpaceX as the two companies build separate launch systems that NASA will certify for use.